People are becoming more and more concerned with monitoring and improving their health these days. With activity trackers, apps, home workout equipment, and gyms that cater to people of every fitness level, it’s easier than ever to take the steps you need to stay healthy. If you’re at the gym a lot or if you’ve just been researching healthy habits online, something you’ll see coming up a lot is protein powder. Protein powder has a lot of benefits. That said, there is one factor that will determine how much you’ll enjoy it and how willing you’ll be to continue taking it: Taste. While you might continue to use a protein powder that doesn’t taste very good, but you probably won’t enjoy it and you definitely won’t look forward to it. There are many flavours available like vanilla protein powder, cocoa powder, strawberry, and peanut butter. When trying to find a good protein powder with optimum nutrition, it’s important that it tastes good and, as far as taste goes, nothing tastes better than chocolate. That said, just because a protein powder tastes like chocolate doesn’t mean it tastes good. We’re here to tell you the best tasting chocolate protein powders so you can buy the best. Before we tell you what some of the best tasting chocolate protein powders are, it’s important to go over the basics. After all, taste is important but there are actual health reasons for drinking any protein powder. Whey: Whey is a milk-based protein that’s easily digested and one of the most common protein powders. They help support immune function and muscle repair. Whey is a whole protein and, of all the different varieties, is the one that dissolves most easily in water. This means that drinks made with whey protein will usually be smoother and more palatable. Soy: Soy-based powders are great for vegans because they’re not milk-based and, in addition to protein, have components that can help build bone mass. Egg: Some powders have egg protein components, which are released more slowly and can help you throughout the day. Rice protein is completely plant-based, another great choice for vegans or anyone who has a difficult time digesting dairy or gluten. Pea protein is not only an economical choice; it’s also hypoallergenic and easily digested. Hemp proteins are another choice for vegans because they’re completely plant-based and a good source of omega-3 fatty acids. Usually, people will get all the protein they need from their daily diet. Sometimes, though, this isn’t the case. There are some reasons why athletes and non-athletes would need a protein powder supplement. Growth. Teenagers especially need extra protein because their bodies are growing really fast. Those growth spurts use a lot of protein. When you’re first starting an exercise routine, especially if you’re trying to build muscle. If you’re ramping up your workouts, say if you’re training for a marathon after only working out three times a week. When you’re recovering from an injury as protein is needed to help wounds heal. If you decide to go vegan as a lot of common sources for protein are eliminated in a vegan lifestyle. If you fall into any of these categories or if you’re just looking for a new, better-tasting protein powder, there are some really delicious tasting ones available. 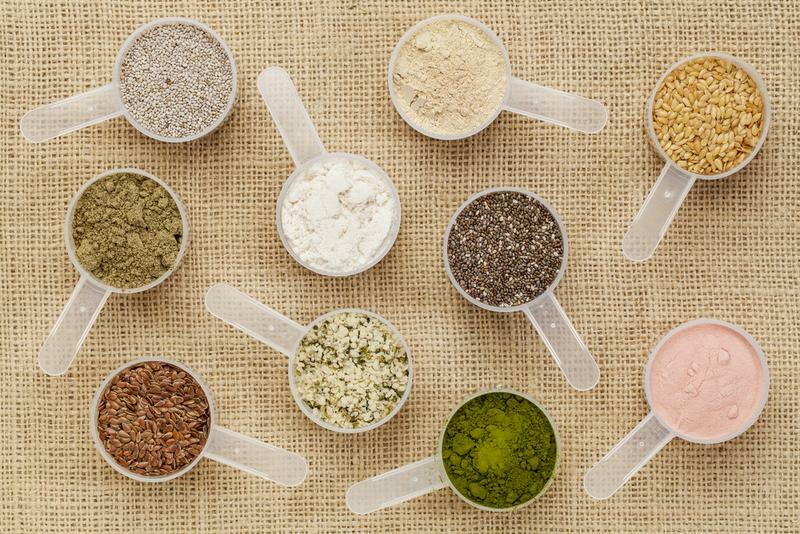 The protein powder you choose will ultimately depend on what you’re trying to get out of it. There are a lot to choose from and, while you want your chocolate powder to taste good, you also need to know that it’s giving you the benefits you’re looking for. To build muscle, choose a powder that is absorbed quickly like whey or whey isolate. If you’re a vegan or vegetarian, stay away from whey and milk proteins and look for plant-based formulas instead. For anyone with diabetes, a high-protein diet is important, but it’s more important to avoid powders that don’t have added sugar and are low in carbohydrates. To lose weight, avoid added sugars or starchy sweeteners as well as anything with added essential amino acids as they’ll promote muscle growth and cause weight gain. There are some medical conditions that will affect how your body will handle protein and you’ll need to be especially cautious about how much you are taking in, both in your diet and through a supplement. For example, if you have kidney disease, irritable bowel, or celiac disease, you’ll need to pay a little more attention to the ingredients of the powder and how much you’re ingesting. Make sure to check with your doctor so you know you’re using the right powder in the right amount. Protein has a lot of important functions in your body, which is why finding a great tasting chocolate protein powder feel like such a win. Not only is protein needed for the production, recovery, and repair of muscle fibers, it’s also a key element in hormones, enzymes, and parts of the immune system. Having a protein deficit can lead to a decrease in muscle function, including the hardest working muscle in your body—your heart! Protein is also an important factor in healing and is essential to making sure that your muscles are repaired and recovered between workouts so you don’t over-train and injure your muscles. Solid food takes much more time to digest so, while you can and do get protein from food, a protein shake gets into your system much faster than, say, a piece of chicken breast. Because your body has less work to do to break it down, it gets to your muscles faster. The most common ways to use protein powder are as a beverage or smoothie. But there are a lot of ways you can incorporate protein powder into your diet. Add some to any kind of batter—cake, muffins, pancakes, waffles. If you use chocolate powder, the finished product will be tasty enough that you won’t need to add any syrup or butter. Mix some into your oatmeal for some added nutrition and flavor. Sprinkle it onto low-fat, high-protein ice cream or mash into a frozen banana. Use in place of cocoa in no bake cookies. Add a little to your corn flakes in the morning for a different twist on a simple breakfast. Skip the syrup and make your French toast tastier by adding some chocolate protein powder to the egg mixture. This is a whey-based protein powder that’s proven to help muscle growth. It has 27 grams of pure protein per scoop. You might assume that a powder with this much protein can’t possibly taste good, but you’d be wrong. The team that developed this powder worked closely with some of the top flavor experts in the field. It not only tastes like dreamy chocolate ripple fudge, but it also dissolves well so your drink or shakes. You end up with a nice, smooth consistency that you’ll enjoy drinking. Alpha Isolate tastes great and gives you the results you’re looking for. A great thing about Alpha Isolate is that it’s quadruple processed using ultra and microfiltration, ion exchange, and hydrolysis. This process makes sure that the protein powder is as pure as possible and contains little lactose or fat. This means you’re getting scant amounts of carbohydrates and fats, neither of which you want in a high-quality, great-tasting protein powder. Not only is this a great product for muscle recovery, it’s also an ideal meal replacement, too. Whether you’re running late in the morning and don’t have time to cook or supplementing meals as a way to lose weight, Alpha Isolate is a great tasting way to start your day. Burn More: Ups your metabolic rate so that you burn more energy, even after training. AMAZON CUSTOMERS SAY: Best tasting protein! |The Best Muscle Builder! |Helped me lean out! If you want to increase lean muscle, reenergize after a workout or burn fat, the hydrolyzed whey protein isolate in PROGENEX More Muscle can do all those things and more. All that and in comes in a delicious Belgian Chocolate flavor. This blend features 20% more essential amino acids than other whey protein isolates and targets type II muscle fibers. This means significant gains in size and strength. It also helps increase your metabolism so you burn more fat—even when you’re not working out. They use an exclusive two-step process that isolates, extracts, and concentrates the growth factors that are found in early stage cow’s milk. Then, through the use of various processes, they break down the protein into its basic peptide form so that it can be easily digested and quickly absorbed into your system. This helps it get to right where you need it, fast, so that repair and rebuilding can begin. Nature’s Best may have started in a cement mixer by two friends named Hal and Ernie who wanted to make products that were pure, effective, and would positively influence people’s lives but, today, it’s one of the best tasting, cleanest protein powders available. The natural chocolate flavor puts this one over the top. MuscleTech Phase8 Protein Powder is a little different than the other powders we reviewed because it’s not a pure whey protein. It’s a blend of whey, milk, and casein protein powders. Each of these is broken down differently in the body, and some take longer than others. The result is a sustained, extended release that provides your body with a steady stream of protein to help your muscles recover and heal at a steady pace over an eight hour period. Each scoop has 26 grams of proteins and essential amino acids per scoop. It’s rated one of the best in flavor and is available in decadent milk chocolate. It’s an ideal choice for a breakfast replacement because the extended release formula will sustain you until lunchtime and beyond. What better way to start your day than a delicious protein packed chocolate shake? This is a vegan formula that comes in a delicious chocolate flavor. It has no yeast, soy, corn, wheat, milk, egg, whey, or gluten. So what does it have? It’s primarily plant proteins, including pea, rice, and chia powders. They’re all high in protein and fiber plus provide a lot of essential minerals. The texture can be a little gritty simply because of the nature of the proteins and it doesn’t dissolve very easily in water but if you add it to coconut or soy milk and throw it in a blender, the chocolate taste takes center stage. While this brand takes a little bit of work to get it the right consistency, the chocolate flavor is delicious. It’s easy to digest and will get to your muscles quickly. This is a great choice for vegetarians and vegans who are looking for a way to up the protein in their diet. This is a segment of the population that really needs to monitor their protein intake generally, even more so if they work out or lift and are worried about muscle repair and recovery. As you can see, there are a lot of really delicious tasting chocolate protein powders. They all share a lot of the same benefits, but each has its own special features to bring to the table. Before you decide which one is for you, figure out what you’re hoping to gain from using a protein powder. Do you need help with muscle recovery after heavy workouts? Are you looking for a meal supplement to help you lose weight or just to give you an easy, quick, and filling breakfast? Or do you stick to a special diet and need to get your protein somewhere other than meat or dairy? Whatever your reason is, there’s a protein powder for you. To make sure your protein powder delivers in taste as well as performance, try one the best tasting chocolate protein powders in our reviews. Alpha Isolate Whey Protein Isolate from Alpha Woman/Modern Man is quadruple processed for a powder that is as pure as you can get. The chocolate ripple fudge flavor delicious and the consistency is smooth and silky. It’s a great way to recovery after workouts. PROGENEX® More Muscle is one of the best tasting protein powders out there and its Belgian Chocolate flavor is no exception. It uses a two-step process to concentrate and break down the proteins into their most basic form so it’s quickly absorbed and starts working quickly and effectively. Nature’s Best Isopure Protein Powder is made by a small company that started by making some of the best tasting, cleanest powders around. They’ve upgraded their packaging and label lately because they’ve moved to a better, bigger facility so they can bring their delicious natural chocolate tasting protein powder to more people. MuscleTech Phase8 Protein Powder brings its own special blend of powders to produce a sustained, extended release that gives you a steady stream of protein for eight hours. This is a great choice for a breakfast meal replacement as it will keep you sated until lunch time thanks to the special formula. Lifetime Life's Basics Plant Protein Mix is the plant-based formula we reviewed. The delicious chocolate flavor makes it a great way for vegans or vegetarians to make sure they’re getting enough protein in their diet. You’ll need to take a little more time preparing this powder because it gets a much better texture when it’s put through a blender, but for someone looking for a vegan product, this one is a delicious one to try. Protein powders are a great way to be good to your body. Regardless of why you’ve decided to use one, a protein powder with delicious chocolate flavor will help you stay the course. You’re more likely to keep taking a powder that tastes good, so we made sure to find the best ones for you.